Mann Tek Safety Break-Away Couplings are designed to seal off flow and break apart under the stress of a hose pull away or other excessive load incident. Marine grade and Industrial grade versions are offered. Install on loading racks, for bulk loading, tankers and rail applications to significantly reduce spills and damage to equipment. 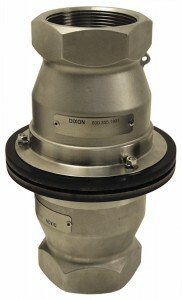 Both segments are valved to reduce spillage from the hose and pipeline. Break away couplings significantly reduce the risk of environmental hazards, equipment damage, and potential operator injury. Breaking-bolt type means that the bolts are designed to shear and release under stress. Available in stainless steel and aluminum.